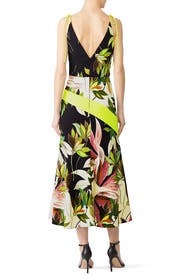 Tropical fauna flourish on this Christian Siriano dress styled with tie straps and thigh-high slit. Sized: 0-18, one length available. Regular measures 53" from shoulder to hemline. Floral printed silk crepe (95% Viscose, 5% Elastane). Hourglass. Sleeveless. V-neckline. Hidden back zipper closure. Fully lined. 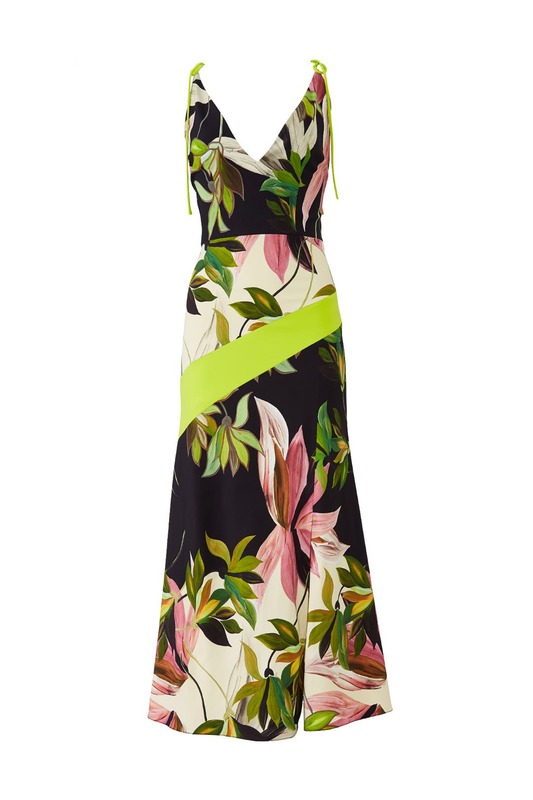 53" from shoulder to hemline. Made in the USA. 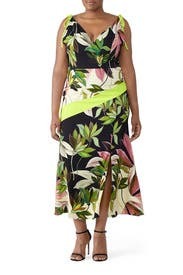 Great dress, I ordered a 6 but it was too big. The fabric and silhouette are both incredibly eye-catching my only beef is that the lining fabric didn't want to stay with the outer fabric. Definitely had to hitch one of the layers down all night long. I was not a fan of the ties on the arms. If the ties weren't there then I probably would have worn it, but I had 3 other choices that ended up looking better. Which size was ordered and how did it fit you? 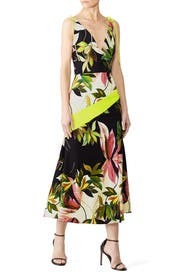 I love this dress and would like to order it. This dress is super comfortable and has a lot of stretch. I ended up not wearing as it didn't seem formal enough for a black tie wedding. 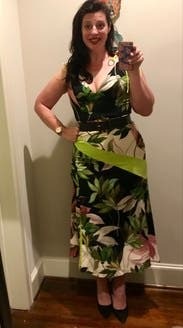 This dress arrived with the tags still on. 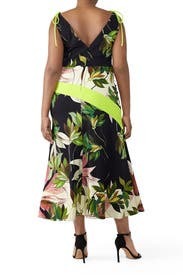 It’s a really nice, heavy fabric with a fun lime green lining and a pretty significant front slit that doesn’t really show in the model photo. I’m between a 12 and a 14 and on the hippy side and it was just a tetch too tight around the hips. Probably could’ve gotten away with spanx under it but I went with something else instead. The top fit well and was thick enough that I would’ve been comfortable without a bra. 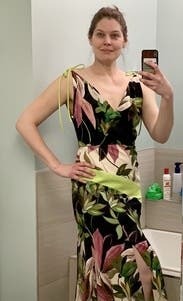 Not the best pic here since I only wore it to try on but I wanted to try to show the front slit—don’t mind the kids bath toys in the background!